NEW: Iranian general: "Our finger is always on the trigger"
TEHRAN, Iran (CNN) -- Iran test-fired a long-range missile on Wednesday in response to what it says are threats from Israel and the United States, Iranian officials said. Iran says this test-firing was a success. "We want to tell the world that those who conduct their foreign policy by using the language of threat against Iran have to know that our finger is always on the trigger and we have hundreds and even thousands of missiles ready to be fired against predetermined targets," Gen. Hossein Salami, commander of the Revolutionary Guard ground forces, said on state TV. "We will chase the enemies on the ground and in the sky and we are able react strongly to enemy's threats in shortest possible time." Iran's Islamic Revolutionary Guard Corps test-fired a Shahab-3 missile and several other missiles during war games in the Persian Gulf called the Great Prophet III, according to Iran's state-run media and a U.S. military source. William Burns, a senior U.S. State Department official, said Iran is "as serious ... a problem as any we face today." The exercise comes a month after Israel conducted a military drill in the eastern Mediterranean involving dozens of warplanes, and the latest Iranian activities prompted concern from Israel and condemnation from the United States. Iran occasionally tests missiles, but this firing comes amid international tensions over its nuclear aspirations. The agency added: "Domestic and foreign political and military analysts believe that Shahab-3 is able to reach targets in the occupied lands in case of the Zionist regime's probable attacks against Iran's nuclear sites." 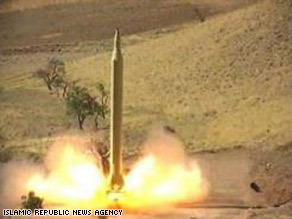 Iran's Press TV said the military "successfully test-fired new long and mid-range missiles." It mentioned the Shahab 3, "which can hit any target within a range of 2,000km." It said the missile was equipped with a one-ton conventional warhead. "Nine highly advanced missiles with improved accuracy were simultaneously tested including the Zelzal and Fateh missiles with ranges of 400km and 170km respectively." Press TV said troops were also involved in the maneuvers in the Persian Gulf and Strait of Hormuz areas. A U.S. military official with knowledge of the testing counted the firing of seven missiles, one Shahab-3 and six shorter-range ballistic missiles. The testing took place over land, the official said. The official, who noted that these kinds of tests had occurred before and were not unexpected, said the tests were tracked by U.S. intelligence. Another military source said another Iranian exercise is under way inside the Persian Gulf with surface ships and submarines. World powers, who suspect Iran is intent on building nuclear weapons, have offered economic and other incentives in exchange for the suspension of its enrichment program. Iran, which says its nuclear program is strictly to produce energy, defends its right to proceed with enrichment. There are worldwide worries that Israel, which is concerned by Iran's plans, is pondering a unilateral strike. Israel's recent aerial military exercise was in part an effort to send a message that it has the capability to attack Iran's nuclear program. The distance involved in the exercise was roughly the same as would be involved in a possible strike on the Iranian nuclear fuel plant at Natanz, a U.S. military official said. In 1981, Israel attacked a nuclear facility in Iraq. Israel also struck a site in Syria that some say was a nuclear reactor under construction. One Israeli Cabinet member, Shaul Mofaz, recently said it "will attack" Iran if the nuclear program was not halted. Last week, the Islamic Revolutionary Guard Corps commander, Gen. Mohammed Ali-Jaafari, said any strike against Iran's nuclear facilities would be regarded a the beginning of war. At the same time, Iranian leaders are discounting the possibility of war. President Mahmoud Ahmadinejad, in Malaysia this week for a conference, told reporters Iran was trying to prevent a confrontation. "We are making all-out efforts to expand peace and security in the world. You should not be concerned about a new war," he said on Tuesday. Mark Regev, spokesman for Israeli Prime Minister Ehud Olmert, said it did not want conflict with Iran. "But the Iranian nuclear program and the Iranian ballistic missile program must be of concern for the entire International community," Regev said. The White House reacted strongly to the Iranian test-firing. U.S. National Security Council spokesman Gordon Johndroe said: "Iran's development of ballistic missiles is a violation of United Nations Security Council resolutions and completely inconsistent with Iran's obligations to the world." Johndroe mentioned that the U.S., Britain, France, Russia, China and Germany "are committed to a diplomatic path, and have offered Iran a generous package of incentives if they will suspend their uranium enrichment activities." "They should also refrain from further missile tests if they truly seek to gain the trust of the world. The Iranians should stop the development of ballistic missiles, which could be used as a delivery vehicle for a potential nuclear weapon, immediately." CNN's Barbara Starr and Elaine Quijano contributed to this report.